The Settings Dialog controls the image size and allows you to save the parameters that create different drawing patterns. To access the Settings Dialog, select "Options -> Settings" from the menu bar. I. Image Page. 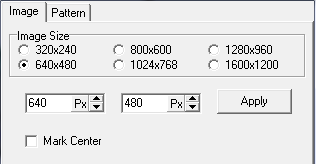 This page allows you the image size. You are given the choice of six commonly used screen sizes. You can also manually enter any possible screen size. When the "Mark Center" option is enabled, the program puts a small cross at the center of the screen whenever the screen is cleared. A. Edit Pattern Name. Any pattern name can by modified by selecting the row and then hitting the F2 key. A cursor will appear in the text that you can move or use to insert or delete text. B. Insert Button. Pressing this button inserts the current pattern at the highlighted row. C. Overwrite Button. Pressing this button overwrites the settings of the selected with the current settings. The original name is still retained. D. Move Up/Down Button. Pressing these buttons moves the selected row up or down in the table. E. Delete Button. Pressing this button delete the currently highlighted pattern. F. Search Button. 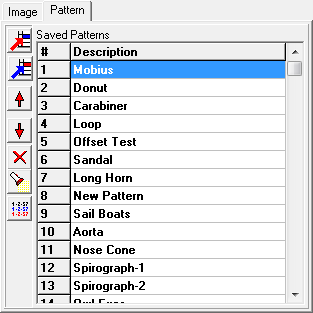 Pressing this button brings up a search box that allows you to search the list for a specific pattern name.